Wildfire, on the surface, appears to be the phenomenon of hungry combustion (in light, flame and heat) that resists human control — a nasty and rapacious blight upon our cultural expectation that wildness ought to stay where it belongs: safely away. Though history shows us, writes Californian John Davis, that rigorous stewardship of burnable lands can be a productive and relatively danger-free approach, the existing "monoculture — with its factory farming, forestry practices, irrigation, industrialization and urban sprawl — has created the conditions ((yes, exacerbated by global warming) for the California conflagrations." 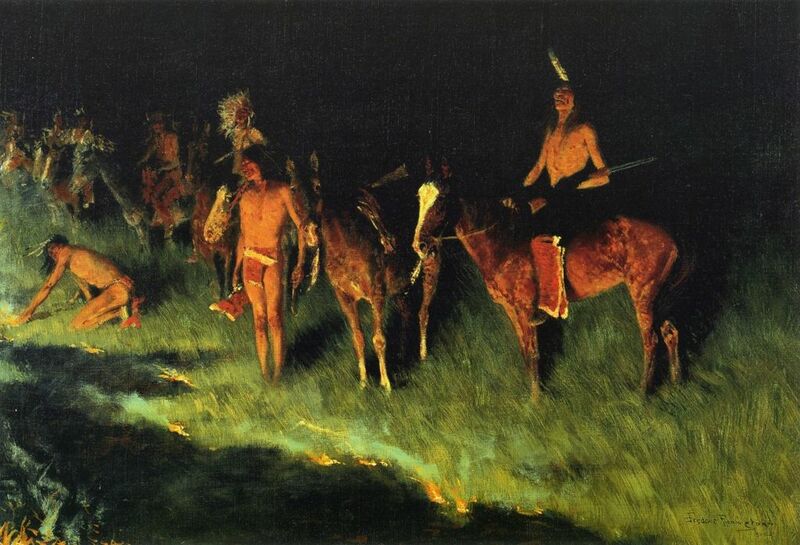 'Grassfire', Frederic Remington, 1908, oil on canvas. Amon Carter Museum of American Art. OJAI, CALIFORNIA — Not so long ago, the people of what is now called California lived with and by fire. It was the element that allowed them to thrive in an environment that did not give up its riches easily. They harvested new grasses and fresh forbs out of burnt lands. Using fire, they sculpted landscapes in which they could hunt their prey (predominantly mule deer) and, of course, they cooked by its heat. Lightning-struck wildfire, when it came, found landscapes where fuel loads had been limited by this careful management of food plants, by the creation of hunting meadows, and the clearing of tangled woodlands where particular trees were privileged over the competing biomass. Elsewhere, perhaps in the rocky hinterlands thick with chaparral or heavy with ancient redwoods, wild fires ran their course. But this was not land in which the native peoples lived, except in those favored spots along the tumbling creeks that were laced across the wild. When wildfires swept across these lands, the going was easy. The burnt earth rendered its blessings. The entangled shrubs of the chaparral do not make for easy human passage. When travelling to higher ground where they might summer beneath pinyon pines, native peoples traveled along narrow deer trails or broad Grizzly pathways or, where neither were available, crawled on all fours beneath the dwarfish canopy. When wildfires swept across these lands, as they invariably did once, twice or even three times a century, the going was easy. The game would be scarce, but it was at such times that new connections might be made with the exposed topography, its sentinel rocks and its sheltering caves. The burnt earth rendered its blessings. Millennia of carefully managed range-lands were entirely dispossessed of their stewards in the half century after the Civil War. By the beginning of the twentieth century, massive wild fires were roiling across the land, indiscriminate in their feasting on unprecedented fuel loads through redwood forests, chaparral and coastal sage scrub. They have not since abated and are now undoubtedly exacerbated by global warming in both their ferocity and frequency. We have carelessly laid the old ways bare: the land’s primordial managers are no more — swept away by the winds of modernity. We are left to suffer the consequences: some twenty fires burning across the state (as of 08-11-18). 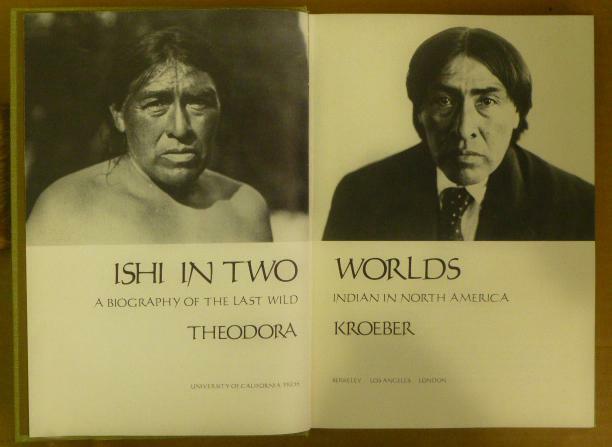 In Northern California, smoke and ash from the massive Carr fire continue to blow across the land of Ishi, immortalized in Theodora Kroeber’s Ishi in Two Worlds: A Biography of the Last Wild Indian in North America, 1961. Ishi was the lone survivor of the Yahi, a band living in the rugged Lassen Mountain foothills, who, in 1911, sought help from the community of white men who had destroyed his people. Through the good offices of a local sheriff, he quickly found food, shelter and some sort of latter-day purpose (demonstrating his native skills) living in the University of California’s Hearst Museum of Anthropology in San Francisco. Kroeber's book is (or should be) in every Californian high-school library for it offers a visceral connection to a discarded way of life. Meanwhile, his people’s ancient trails, canyons, cliff faces, and caves are threatened by fires spawned by the white man’s genocidal history, his fossil economy and by his alienation from his environment. to her tale of the ‘Last Wild Indian’. America’s wilderness has been mediated, over the last half millennium, almost exclusively through European Romanticism. Meanwhile, California’s wildlands are corralled in a subset of this tradition - a niche famously developed by John Muir - and now, as fire explodes across the state, they are securely situated in California’s world-renowned 'Apocalypse Theme Park' (Ecology of Fear, Mike Davis, 1998). The current blaze in the Cleveland National Forest is named the Holy Fire, with its signature media image being a massive mushroom cloud emerging from the chaparral. 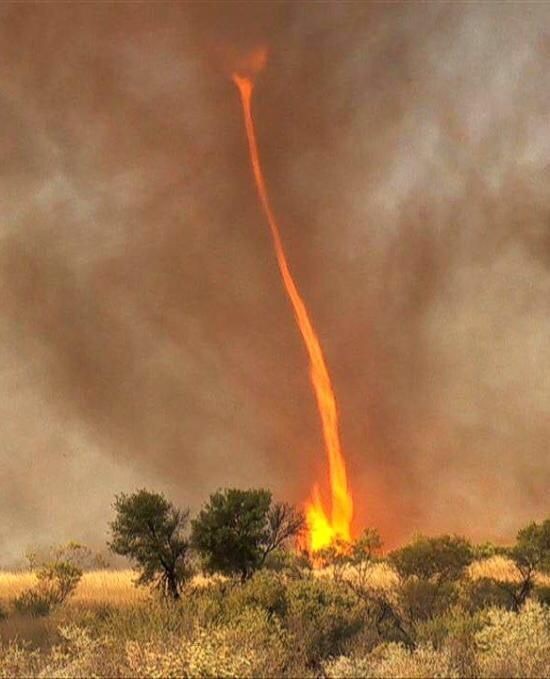 Earlier this month, a 15,000 feet high, quarter-mile wide fire tornado whirled out of the Carr fire to take its place in this spectacular tradition with winds in excess of 140 m.p.h. 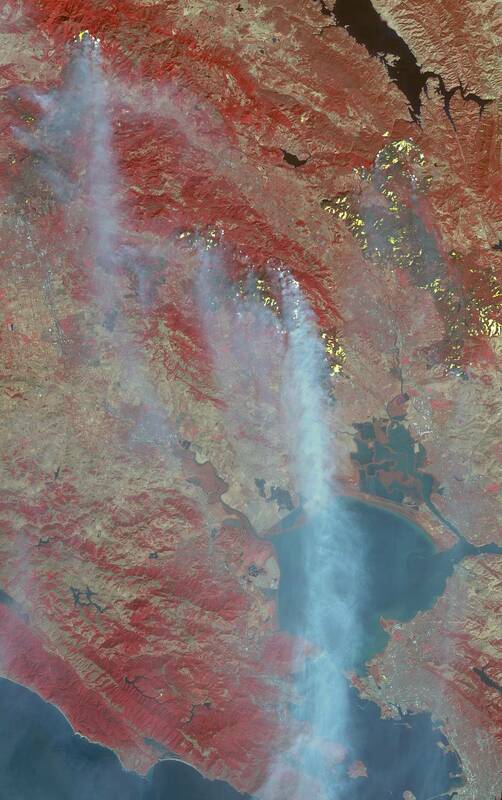 The terrifying gigantism of the Mendocino Complex Fires, totaling over 300,000 acres and still burning, make them worthy additions to this Promethean carnival. Vast reaches of California, and indeed of all the West, were long considered areas into which Indians could voluntarily withdraw or be mercilessly pushed under pressure from the Eastern colonization of the continent. Little considered was that bands of native peoples already occupied most, if not all, the favorable ecological niches in these areas. With the discovery of gold in California at Sutter’s Mill in 1848, and the subsequent influx of largely Anglo-American ‘49ers, the native peoples of the state were newly imperiled. The Spanish, in their quixotic dream of establishing agriculturally productive feudal estates peopled by quiescent, baptized native serfs, reached only as far as Monterey, yet they had initiated, albeit accidentally, the genocide of the Indians. In a much more deliberative fashion, gold fevered Anglos — inspired by their Manifest Destiny of capital acquisition and imperial conquest — completed the mission. As Karl Kroeber writes in his introduction to his mother’s book, “No state in the Union surpassed the Golden State in systematically and shamelessly harassing, murdering, and stealing from its native inhabitants”. In Tending the Wild, Native American Knowledge and the Management of California’s Natural Resources, 2005, M. Kat Anderson demonstrates the costs of the cultural and corporeal eradication of these highly effective stewards of the wildlands. She writes, “There were productive, expansive grasslands not only along the coasts, in the Central Valley, and in montane meadows, but also in the open understories of many woodlands and forests throughout the state that had been perpetuated by Indian burning”. It was the replacement of a mosaic of Indian lifeways and their managed wildlands with the uniformly materialist, rapacious and ecologically ignorant American monoculture — with its factory farming, forestry practices, irrigation, industrialization and urban sprawl, along with steel and concrete transport corridors — that have created the conditions (yes, exacerbated by global warming) for the California conflagrations. War against Imperial Japan and Nazi Germany made possible a collective fight against fire. The state’s response echoes the nation’s post-Civil War solution to the Indian populations that lay in the path of westerly conquest — call in the U.S. Cavalry. As the U.S. Army’s Chief of Military History has it in Winning the West, The Army in the Indian Wars, 1865-1890, the Cavalry’s function was to “. . . protect the arteries of white settlement across the frontier. At the same time, operations were launched against Indian tribes that represented actual or potential threats to movement and settlement”. In California today, metastasized fire response teams dedicated to fire-suppression are coordinated under an Incident Command System, a model of inter-agency cooperation. It was developed in the 1980’s in the face of the increasingly complex demands of dealing with wildfires that refused to respect their wildland borders and impinged on urban infrastructure. 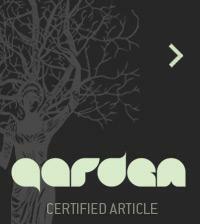 It has since become a universal protocol for all-hazard emergency systems. In California, A Fire Survey (2016), Stephen J. Pyne, the nation’s preeminent pyro-historian, explains the tangled roots of the bureaucratic efforts to establish this militarized model of engagement with perceived existential threats. It is a history that begins, ideologically, with the cavalry, but extends through the stewardship of the U.S. Army over the national parks up until the creation of the National Park Service in 1916, (which explains the martial aspect of contemporary N.P.S. uniforms) through World War Two, Korea, the Cold War, and Vietnam. As Pyne writes, “War against Imperial Japan and Nazi Germany made possible a collective fight against fire. When the war ended, the military crisis was discharged into civilian life . . . A state of continual emergency demanded a cataclysm that would recur in place and time with some regularity. California fire was ideal.” When the demand emerged during the Vietnam War to “bring the war home”, air-tankers that might once have dropped agent orange or napalm were refitted to discharge fire retardant. Huey helicopters, direct from their service in Vietnam, were requisitioned as attack choppers ready to drop water, foam and hot-shot fire crews directly into the battle field. The militarization of Cal Fire, formed in 2006 as the lead agency in fire suppression, meant that all pretense at land management had been subsumed within its role as an emergency fire responder. The Indian way of forest stewardship, the seasonal burning of the montane woods and the lowlands, which came to be known in fire-fighting circles as “light-burning”, and considered to be a credible prophylactic to cataclysmic fires for much of the twentieth century, was deemed anathema. What Stephen J. Pyne calls ‘good’ fires were outlawed in the late 1980’s after Yellowstone went up in smoke in 1988, following the Reagan era policy of ‘let it burn’. One ‘good’ fire turned ‘bad’ was enough to invalidate, in the eyes of officialdom, a tradition that had served humankind since time immemorial. In the Shasta Cascade, lands long kept safe by Ishi’s Yahi band (a part of the Yana peoples) — along with their neighbors: the Modoc, Maidu, Okwanuchu, Paiute, Shasta and the Wintu — are now subject to urbanized, militarized assault by an agency that sources many of its front-line fire-fighters from the state’s penitentiaries. Similarly, the sacred places, burial grounds and rock shelters of the Kumeyaay, Luiseños, Cahuilla and Cupeño, tribes that once roamed the oak meadowlands and rocky defiles of the Cleveland National Forest, are now engulfed in flame and subject to the awesome powers of the state’s fire-suppression machine.